Through that chance meeting and similar events in the years since – and separate from thinking they are great people who I am lucky to know, period – I’ve become a huge fan of Carey and Wendy’s work, both as 2/3rds of Pinko Communoids and in their Grapefruit Experiment form. Their ability to fuse focus and abandon, seriousness and play is incredibly inspiring. 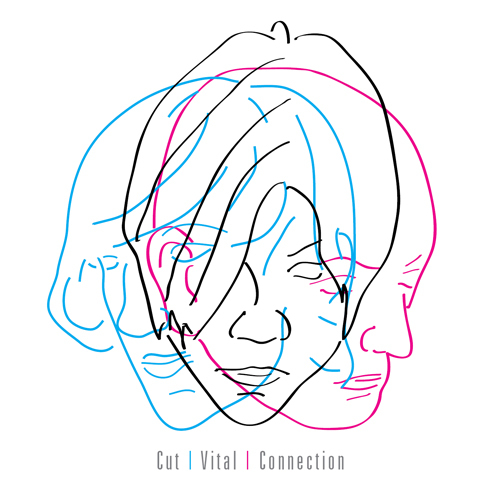 So, I was humbled by the chance to collaborate with them on the improvisations that became Cut | Vital | Connection. The three of us were explicitly interested in coming together as individuals with studied connections to our individual instruments, while also removing any artificial solemnity from the process. (In fact, we chose to remove laughter from the ends of several of the performances when we were preparing these MP3s.) It’s my hope that some sense of the fun and excitement that existed in the room comes through in these recordings. Please click here to download a ZIP file containing the record (as 256kbps MP3s) and the cover (in two resolutions).